I can't recommend talking fly enough!! They were the videographers at our wedding in August and not only are they such lovely people but are so so talented. Our wedding trailer has brought tears to all our family and friends, it is so beautifully done and encompasses us perfectly. The full video is such an amazing memory and we will treasure it forever. Thank you so much Ryan and Carrie for being fantastic!! 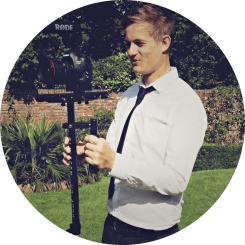 Based in the South East, covering London, Kent, Essex and beyond – we specialise in natural unobtrusive wedding videography. With our distinctive style and modern approach, we can turn your wedding memories into a visual masterpiece. With over 7 years’ experience in the wedding industry and over 260 weddings under our belt – we’ve crafted our own unique style of wedding film that is quite unlike any other. Our natural and relaxed approach allows us to discreetly capture those precious memories whilst having minimal impact on your wedding day. Our natural stance avoids the need for any staged shots or scenes, allowing brides, grooms, bridesmaids and the entire wedding party at large to enjoy the day without any added pressure. Our large zoom lenses and latest 4K cameras allow us to capture those natural moments without you even noticing. Framing your day in the magic of 4K video, Talking Fly will tell your story through stunning motion images that speak for themselves. Don’t take our word for it, take a browse and see for yourself. Allow us to keep your wedding memories alive – future proofing your special day for generations to come. Offering wedding video services in London, Kent, Essex and beyond; get in touch today. Based in the South East, covering London, Kent, Essex and beyond – we specialise in natural, unobtrusive wedding videography. With our distinctive style and modern approach, we can turn your wedding memories into a visual masterpiece.